This is the season of graduation. Last week I was honored to attend the graduation ceremony of my rabbinical school, the Reconstructionist Rabbinical College, as a board member of the Reconstructionist Rabbinical Association. Ozi had his graduation exercises from middle school earlier today before all the eighth graders went off to Wild Waves. And this coming week I will have my own graduation ceremony. This past year I was fortunate to study at the University of Washington School of Professional and Continuing Education, where I participated in the Certificate in Nonprofit Management program. From September through June I went up to Seattle every Wednesday to study with close to 30 other students all working to learn more about the nonprofit sector. My last class was last week, and this coming Wednesday is the graduation ceremony for all the certificate programs. And while it is optional, I do plan to go because, well, I like ritual. The learning was wide ranging, and I did learn a tremendous amount. I learned about budgets and legal issues. I learned about leadership roles and supervision. I learned about overused words and fundraising appeals. In last week’s Torah portion, Behaalotcha, there was a poignant moment. The Israelites, after a long sojourn at the foot of Mount Sinai, are preparing to begin their journey to the Promised Land. A lot has changed: the group of former slaves liberated from Egypt have become a full-fledged community. They received the Torah and laws, organized themselves into tribes and hierarchies, build the Tabernacle, established norms and rituals and a cohesive communal identity. This transformed group is now ready to move forward on their journey. This is a significant exchange, considering the role Jethro played in the development of the Israelites. Moses remembers the important role Jethro and his advice played in the life of the Israelites. Moses through his leadership out of Egypt and as the receiver of the law on Sinai represents the mission of the Israelites. What Jethro represents therefore is the need to impose practical advice and structure in order for the Israelites to fulfill their mission. After the Israelites left Egypt, the idea of freedom, the idea of a new home, the idea of Torah, is not enough. In order to make the transition, the Israelites needed a new norm to help hold them together and make those ideas a reality. 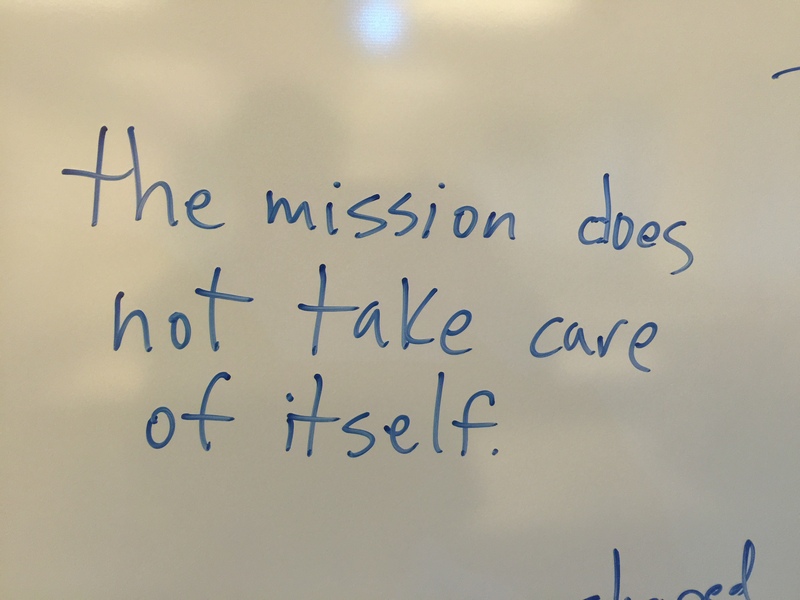 In other words, the mission will not take care of itself. Through taking this class at UW, I feel I actually deepened my work as a rabbi. For how can I implement the mission and vision of building sacred community, of creating opportunities for personal transformation, of having a base from which to do the work of tikkun olam and social justice, without the practical guidance and structure of the synagogue to support me? Our synagogue mission, my rabbinic mission, will not take care of itself. We need a strong institution and structure to support it. This takes personal effort as well as practical knowledge. This is why I am grateful the Temple Beth Hatfiloh Board supported me in pursuing this education. In order to help facilitate our development as an organization—for synagogues are a form of nonprofit organization—we agreed that it would be helpful if I increase my knowledge and broaden my skill set. This way I can help the Board in fulfilling our congregation’s mission. And while education programs come to a close, and we have graduation ceremonies, we must remember that learning and guidance is on-going. Moses recognizes this too. After Jethro announces his departure, Moses pleads with him to stay—the need for practical guidance in fulfilling one’s mission is not finite. The Israelites will need both Moses and Jethro. So too with us. While we need to be clear on our missions, we also need to be clear on the means to attain that mission. We too will always need both Moses and Jethro. Is Capitalism Hurting Synagogue Life?